For 50 servings, line 3 sheet pans (18" x 26" x 1") with pan liner. Place 8-9 tortillas side by side on each pan (use a total of 25 tortillas). Reserve for step 5. 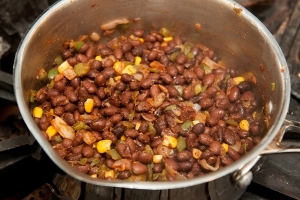 Combine peppers, onions, black beans, and corn in a pot or tilt skillet. Cook on medium heat for 5 minutes. Dice tomatoes and add diced tomatoes to vegetable mixture. Drain excess liquid. Combine chili powder, cumin, onion powder, and paprika in small container. Add spice mixture to vegetable mixture and mix well. 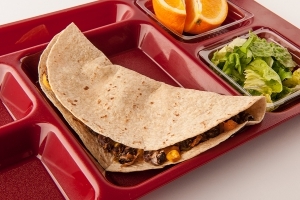 Sprinkle each tortilla with 1/8 cup of grated American cheese. Spoon 1 cup and 1 tablespoon vegetable mixture on to each tortilla. 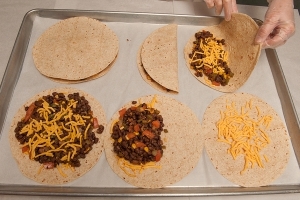 Sprinkle each tortilla with 1/8 cup grated cheddar cheese. Place remaining tortillas on top, pressing down gently. Spray tortillas with pan release spray to aid browning. Conventional oven: 400 degrees F for 10 minutes. Convection oven: 375 degrees F for 7 minutes. 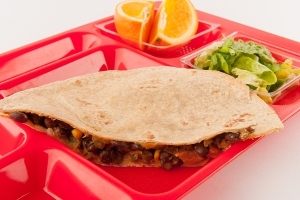 Allow quesadillas to stand for 5 minutes, then cut quesadillas in half. Portion one half of a quesadilla for each serving. One portion provides 1¼ oz. eq. meat/meat alternate, 1¼ oz. eq. whole grains, and 1/8 cup other vegetable. 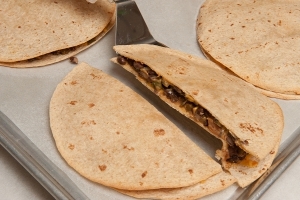 Tortillas with vegetable mixture and cheese - this picture demonstrates both the cut and the folded method. 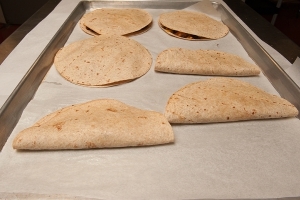 Baked Vegetable Quesadillas - this picture demonstrates both the cut and the folded method.